This morning a dog stole my toast. Actually, the dog was mine. Because she was sitting on the bed when I crawled in with my breakfast tray, and because I set the tray down and held my plate in my hand in front of me but was looking behind me while I was scooting backward against the headboard, and because she was sitting directly in front of me, she thought I was offering it to her. She was delighted to be offered a piece of buttered toast (imported Irish butter, no less), and took it. I turned around to see her sitting stock-still on the bed in front of me with a whole piece of toast in her mouth. What a delightful surprise! A day when a dog unintentionally steals your toast is a harbinger for miraculous, magical things to come. Oh. If that’s the gift of miracles, I guess I have it. So I knew that if my dog stole my Irish-buttered toast, I should encounter at least one more miracle today. And within the hour, I did. Husband Don, toast-stealing dog Callie, and I took a walk. We’d gone only fifty feet when I saw a sweet gum leaf hovering in the air about five feet from the ground. It tumbled and twirled and danced. It careened out and flew back, but it stayed hovering in the air. It knew we were watching, so it showed off. “Hey, Don,” I said. “Look at the leaf! It’s a miracle!” We stood quietly to watch it. “It’s stuck on a spider-web strand,” he said. “Spider silk. They make it from a gland in their bodies. Once for ounce, it’s five times stronger than steel. NASA studies it for spaceships.” I’m afraid of spiders, but their architectural acumen and artistry delight and amaze me. So today was a day of little miracles, and for that, I offer this prayer. Thanks God, for everyday miracles. Thanks for a dog who unintentionally steals my toast, a sweet gum leaf who dances in the air, and the architectural marvels constructed by a fellow earthling with a brain the size of a grain of sand. Miraculous, magical world. Thanks, miraculous, magical God. Last Saturday morning I was decorating the serving tables in the church parish hall for coffee after the Sunday service. Created an autumn explosion of color with all the usual fall accoutrements: pumpkins, acorns, pine cones, leaves pulsing with color, and one of my signature items scattered with abandon: river gravel instead of confetti. My unexpected, funny elements were my trolls playing musical instruments. I love them. I have thirteen of them. I have two cellists; three sax players who may be blind because they are wearing dark sunglasses; and three beatific, angelic-looking euphonium players wearing Norse helmets with horns. I don’t know whether they play euphoniums or baritones because the instruments look the same on the outside to me. About their only difference is the shape of their internal bores. I don’t spend much time worrying about that. But I like the word euphonium better than baritone, so that’s what I choose to think they’re playing. I also have five demented-looking drummers. They don’t look like they’re dangerous. They just look like they’re nuts. Together, I call them Five Demented Drummers and The Band. Five of my trolls peeked out from amidst the leaves and behind the pumpkins on my tablescapes. Most people never even noticed them on Sunday. But I knew they were there. I think the woods are full of trolls who play musical instruments. I think they sleep in the summer heat; their furry tails sweat, and having sweat run down your tail is most unpleasant, so they reverse hibernate. They hide in their caves in the winter, but they don’t sleep; they sit by a roaring fire in an enormous fireplace in a cavernous hall and play troll music. And dance. Eat biscuits and jam. Blackberry jam. And fried pies. Blackberry. Drink blackberry ale. I like that image. My musical trolls come out in the spring and fall. In spring, they play music in the light of the moon. And right at dawn. You have to listen closely because the birds sing so loudly. But if you are patient, listen intently, and believe, you can hear them. 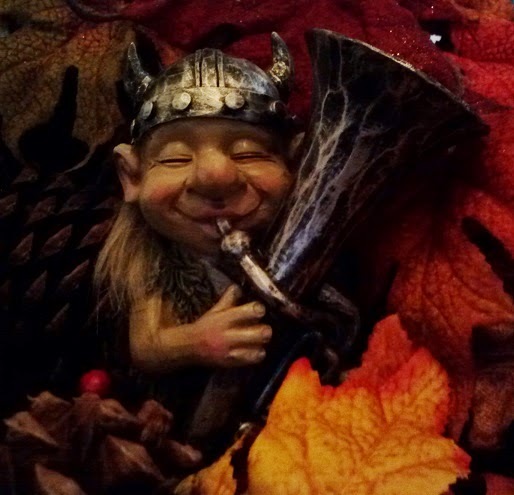 But fall is the musical trolls’ favorite time of year. They stay outside all day playing their music. You can’t see them because of the fallen leaves, pinecones, rotting logs, pumpkins. They take tiny knives and axes and burrow their way into the pumpkins from the bottom where the pumpkins are lying on the ground. You don’t see anything when you walk by; the trolls’ hiding-pumpkins don’t look like jack-o-lanterns. They look like ordinary pumpkins. But the trolls see you. They drill tiny peepholes into the pumpkins so they can watch you as you walk down the trail, enjoying the fall color, blissfully unaware of them. 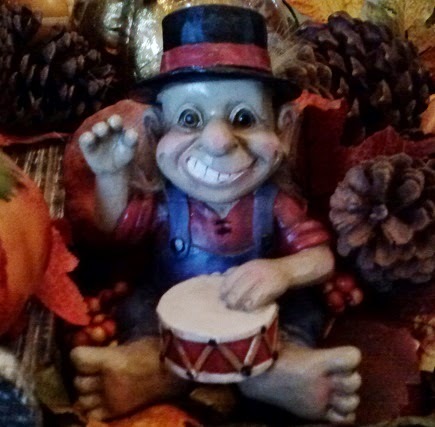 I am a joyful Episcopalian, and I figure that if God could choose to make something as irritating as human beings who are endlessly troublesome, then that same Creator could choose to make something as delightful as musical trolls who aren’t any trouble at all. G’fernock. That’s troll for Amen. Saturday morning I decorated the tables in the church hall for fellowship after the Sunday service. I was wearing my tee-shirt that proclaims “I’m a Joyful Episcopalian.” My friend, Dan, an old lawyer who wears a patch over his blind eye, was locking and loading the coffee urns. I finished decorating and goodbye’d Dan, who was still puttering around in the kitchen. I wheeled around the corner and into the narthex. A wild-eyed woman clutching her purse to her breast startled me. Tall woman, too thin, shoes and dress expensive and immaculate. Dyed hair wild. Eyes too, darting like a rabbit pursued by a fox. Thought she might dart and run out the door if I approached her too fast. “May I be of assistance?” I asked gently. You’re a stranger, I thought. Then, People get lost in the village all the time, but this is different. Something is terribly wrong here. “My mother’s house. I can’t find it. She didn’t call to let me in the East Gate, but the officer knew me because I come all the time. He let me in. I don’t know why my mother didn’t call. But she didn’t. And now I can’t find her house. I’ve been driving around for a long time, but nothing looks familiar. I didn’t know what to do, so I came here.” She blinked back tears. “Good idea,” I said, thinking, Church is always the best place to go when you don’t know what to do. She got out her driver’s license and gave it to me: Little Rock. An hour and a half away. “Okay,” I said, “That’s your address. I need your mom’s address.” She dug some more. “I don’t think I have it,” she said, abandoning the purse search. “I know she lives on Delfina Way,” she said hopefully. “Then follow me. I’ll put that into my GPS, and we’ll drive around it until something looks familiar.” I started toward the door. I led her to the kitchen. Umhm. Lady’s right. She has dementia. We hurried out to our cars. A dog was sitting in her car, windows rolled up. Panting. Too hot to leave a dog in a locked car. But this lady didn’t know her mother’s name, so I couldn’t blame her for locking a dog in a hot car. “This is my dog, Sheeba. She’s Shiba Inu and Basenji.” Sheeba struggled to get loose from her doggie seatbelt. “She’s all I’ve got. I don’t have any children. It’s just Sheeba and me. And my mother doesn’t like her. When we come visit, Sheeba has to stay outside. I have to tie her to the porch because Mama doesn’t have a fenced yard.” My Stranger’s eyes filled with tears. I started my Subie and my Stranger pulled in behind me. As soon as I turned onto Delfina Way and came to a fork, she pulled up beside me. “I think it’s this way,” she called through her passenger window and pointed to the left. She pulled ahead, drove fifty feet, and stopped. I pulled up beside her and lowered my passenger window. “Nothing looks familiar,” she said. “Sue Roberts,” she said, as though she’d known it all along. I called the front gate. Guard gave me the address. #123. Roads here in the village wind around, circle, divide, circle back, wind around in the opposite direction, and end up somewhere you’ve never been before. But we’d reached #79 and were headed in the direction of #123 when she pulled her car up beside mine again. “We passed a road going left,” she called. “I know, but follow me. I promise we’ll get there this way.” She pulled back in behind me. In three minutes, we pulled up to #123. I got out of my car. “This is it,” she said. Mama was fine, but angry. She was on oxygen, sitting at the kitchen table. House was spotless. No dogs allowed. “Who’s that?” she demanded, pointing at me. I stepped forward. I felt like I had to protect my Stranger from her mother’s wrath. I’m an old, retired college professor. I’ve lived through having a gun held to my head by a stranger who wanted to kill me, survived a brain tumor, beat congestive heart failure, sued the city where I lived, and been tried by a renegade bishop on a Canon 13. I don’t scare easy. 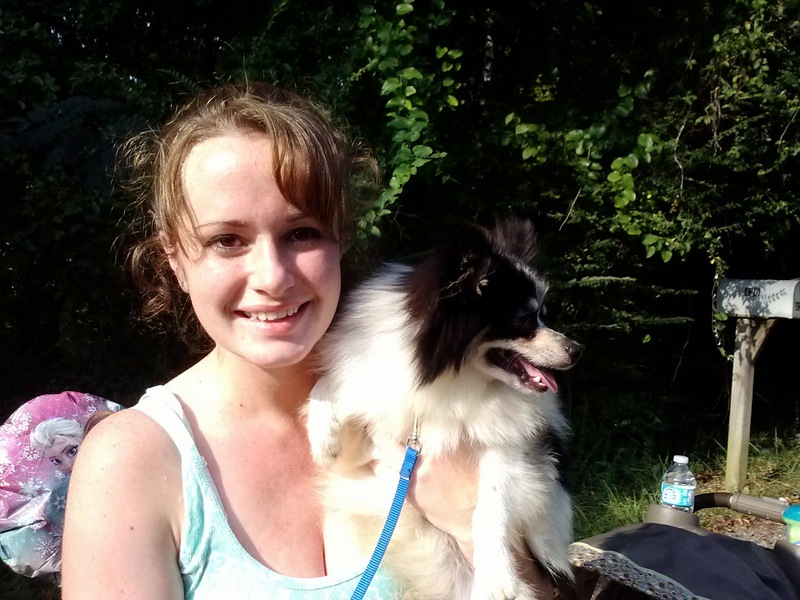 I stayed to help my Stranger get her dog settled on the back porch: bed, water, tether. She couldn’t remember how to attach the dog to the tether, didn’t remember that the water bowl had to be filled. I went back in the house to talk to the mother while the daughter was on the porch apologizing to the dog that it couldn’t come inside. I left the house after that, sad for my nameless Stranger. Sad for her mother. Sad for her dog, Sheeba. But at the same time, a Joyful Episcopalian. Because being joyful doesn’t mean never being sad. Being joyful means finding Christ’s peace in the midst of life’s sorrows. Being joyful is knowing that when you’re lost, church is the best place to go. The safe place. A place where you can find Someone to help you. Sometimes you only need to sit quietly in the sanctuary and feel the Someone’s presence. But sometimes the Someone works though an old lawyer with a patch over his eye. Or through an old woman who is honored when Christ finds small ways to allow her to be of service to Strangers and their dogs. An old woman who wears a tee-shirt proclaiming that she is a Joyful Episcopalian. Arkansans love animals. Arkansas is #1 in dog ownership in the nation, #7 in pet ownership. Unfortunately, it’s also 48th in median family income. People in the hills of west-central Arkansas are the folks we serve in our mobile spay and neuter clinics. Good, honest, hardworking people. Help their neighbors. Many were not able to finish high school. Many are functionally illiterate. Many are disabled. They live in poverty. But they try to help animals. These good people can barely feed themselves, but they give of what little they have to care for the endless stream of injured, frightened, abandoned puppies and dogs who collapse on the roadside after they've been thrown out of a moving car on the county road. Or abandoned by a desperate neighbor who moved away. They bring freezing kitties out of the winter night, kitties who are trying to warm themselves on a car engine, or who come to their doors anemic from ticks and fleas. They feed colonies of skinny feral cats and watch helplessly as they multiply exponentially. 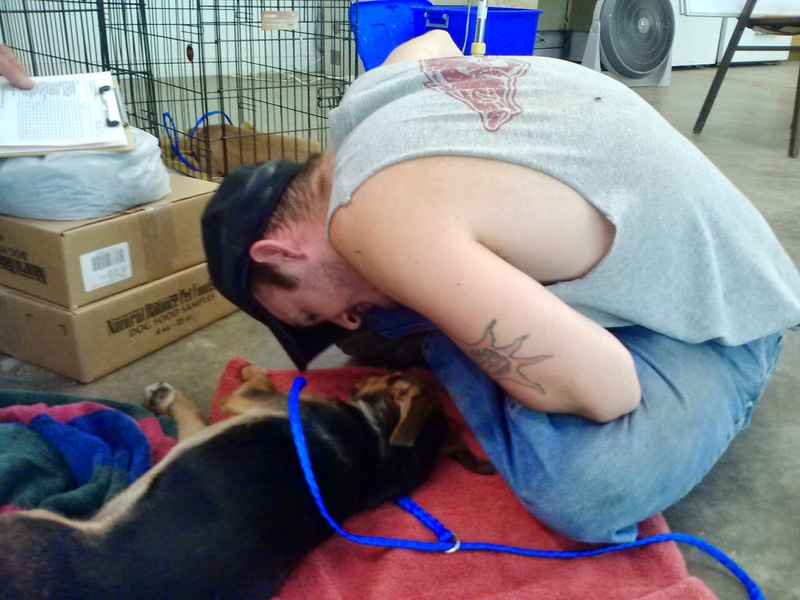 These are the people and animals the Hot Springs Village Animal Welfare League Spay and Neuter Clinics help. Not the middle-class people of Hot Springs Village; the people in the poverty-stricken areas around it. 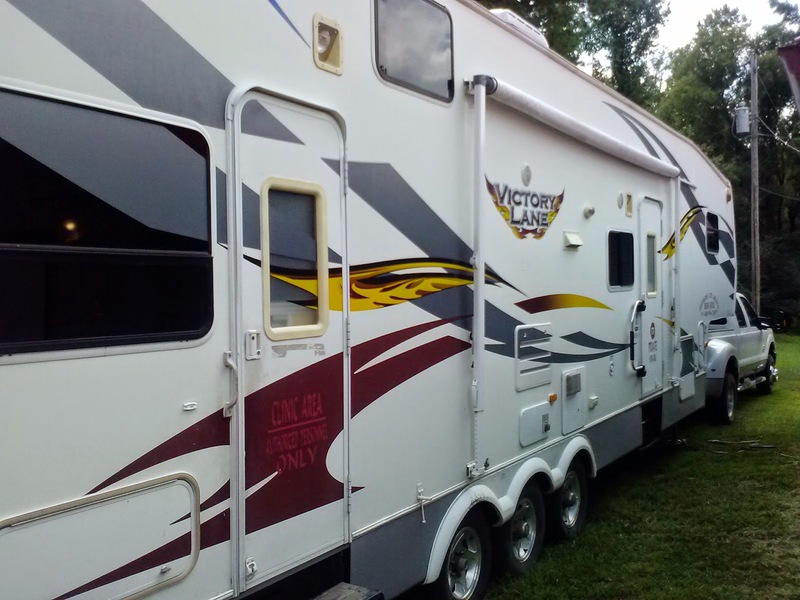 The League offers four 2-day mobile spay and neuter clinics a year in Mountain Pine, Fountain Lake, Crows, and Jessieville. Jessieville’s not on the census. Crows isn’t even on the map. But people live there. The League contracts with Arkansans for Animals, a nonprofit that runs a mobile clinic and keeps it staffed with a vet and two assistants. But a hundred volunteers are needed to make each two-day clinic run smoothly. League members post signs advertising the clinic, but word of mouth from former clients is the most powerful advertisement. People call their neighbors, go tell their friends who are sitting on their porches, knock on doors of folks who don’t get out much. Then, the first day of the clinic, people start coming. The return clients are confident and excited. The new clients are tenuous, anxious. But down the road they come, leading big and little dogs of every ilk: shepherd mixes, pit mixes, small purebreds dumped by puppy millers, whole litters of half-grown pups. From their battered old cars, they unload crates full of the community cats and kittens they feed. Red-shirted volunteers go into action. They complete paperwork and process whatever fee the clients can pay. 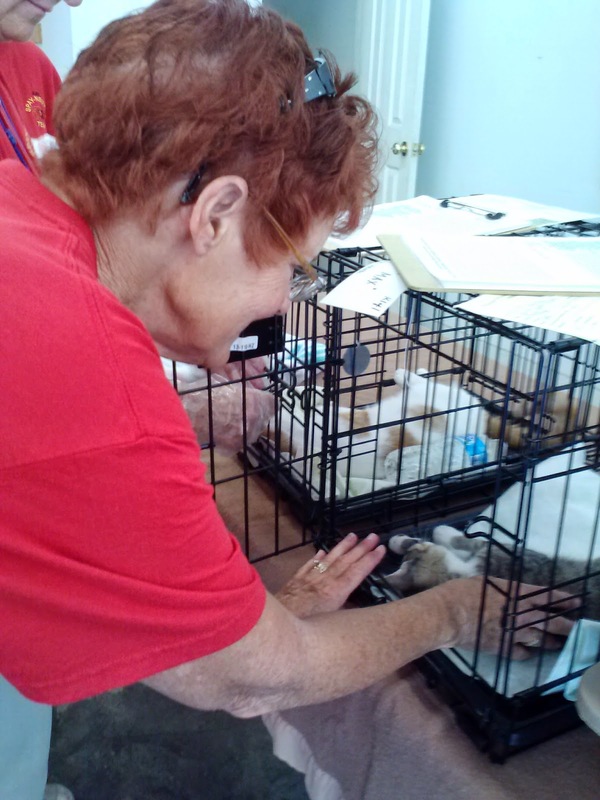 Other volunteers crate the animals and comfort the frightened ones. 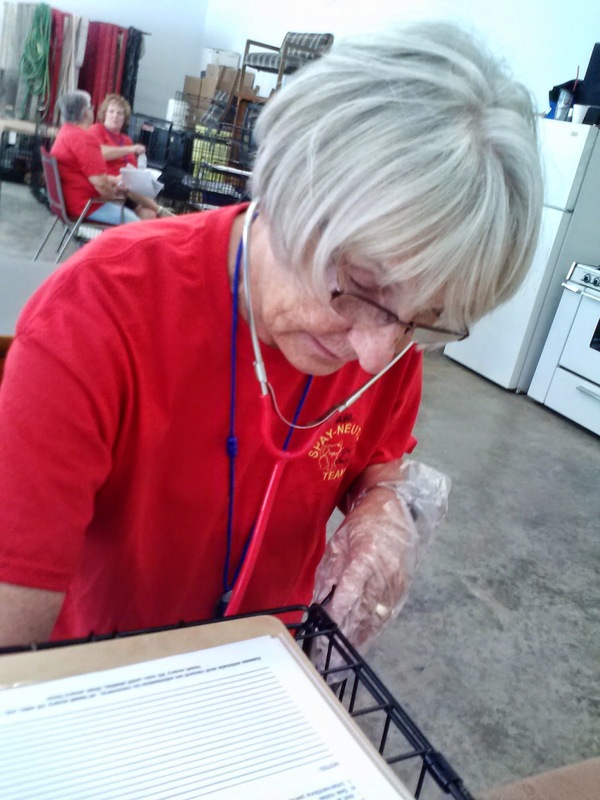 More volunteers schedule the order of surgeries and carry the animals to and from the mobile operating room. When the volunteer cooks arrive with food and water at noon, those on the front line grab a sandwich and a drink on the fly. Good Samaritans stay one-on-one with animals as they begin to recover from surgery, talking to them, stroking them, reassuring them. Owners who arrive early are allowed in the recovery area to comfort their animal family member. 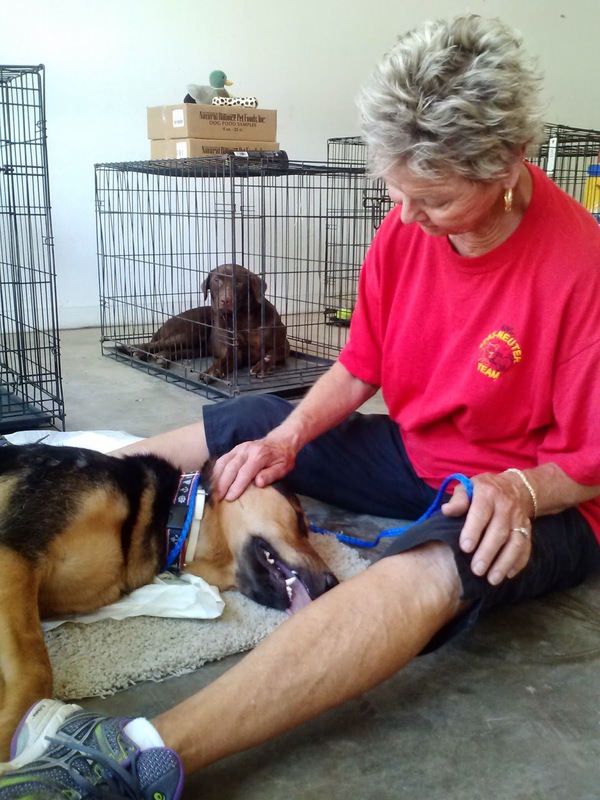 Volunteers give pedicures to sleeping animals who need them, check them for fleas and ticks. 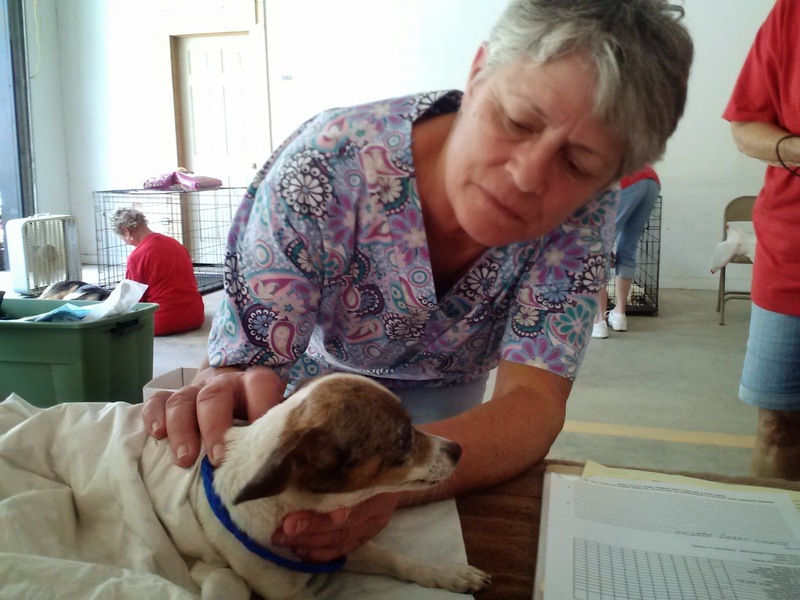 Nurses and a retired vet check every animal and stay close to those having cardiac or breathing problems. 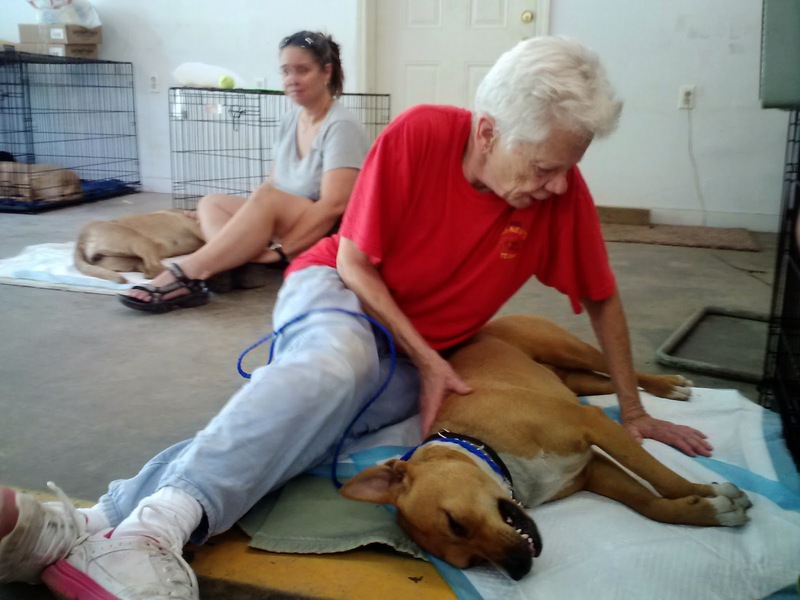 Experienced volunteers massage and talk to animals having difficulty awakening. 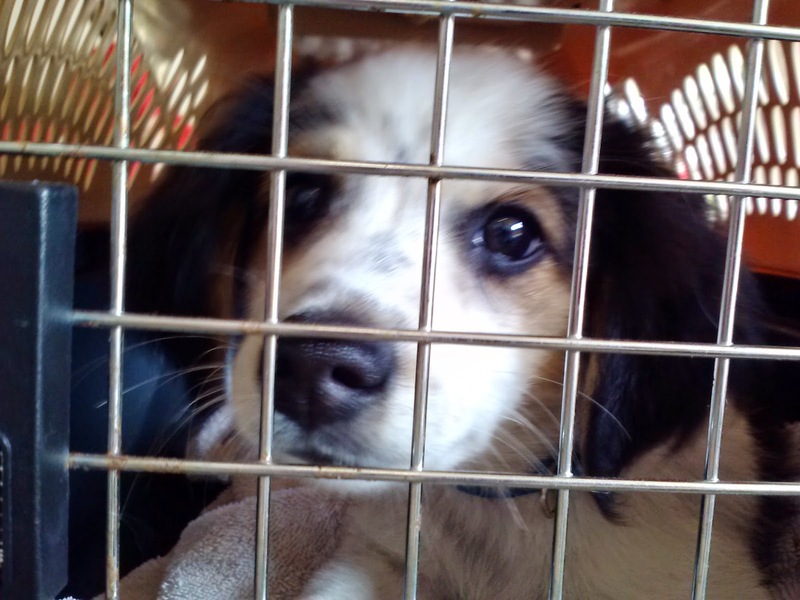 Owners receive education and counseling as they arrive to claim their dogs and cats. 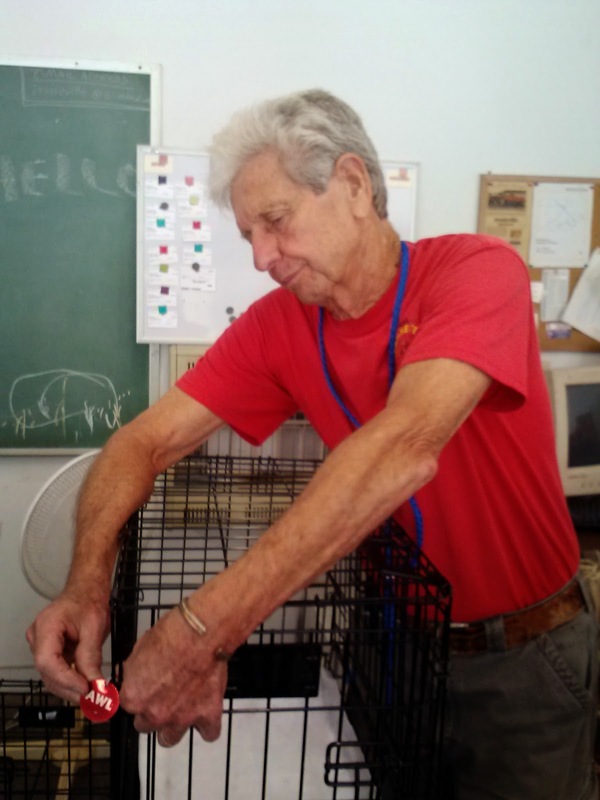 They receive gifts of food and other pet supplies. They thank the volunteers over and over. “You don’t know how important this clinic is,” they say as they gather their beloved animal companion to head home. "You don't know how much this community needs you. You make such a difference in our lives. We don't know what we'd do without your help. We don't know what our animals would do." Hot Springs Village Animal Welfare League doesn’t need to provide spay and neuter services for Hot Springs Villagers. The Village is a gated community of retired middle-class people (mean income $51,502) who pamper their companion animals. When Villagers die or must move into nursing homes, The League steps in to help rehome beloved animal companions. The League provides world-class care for animals who wander into the village as strays or are dumped off here in the middle of the night, sometimes injured or ill, and that happens more than you might think. The League manages a no-kill shelter with six runs, a beautiful play yard, and plenty of volunteers. A strong foster program is a mainstay of The League, and the foster families helped The League adopt out 301 animals in 2013. 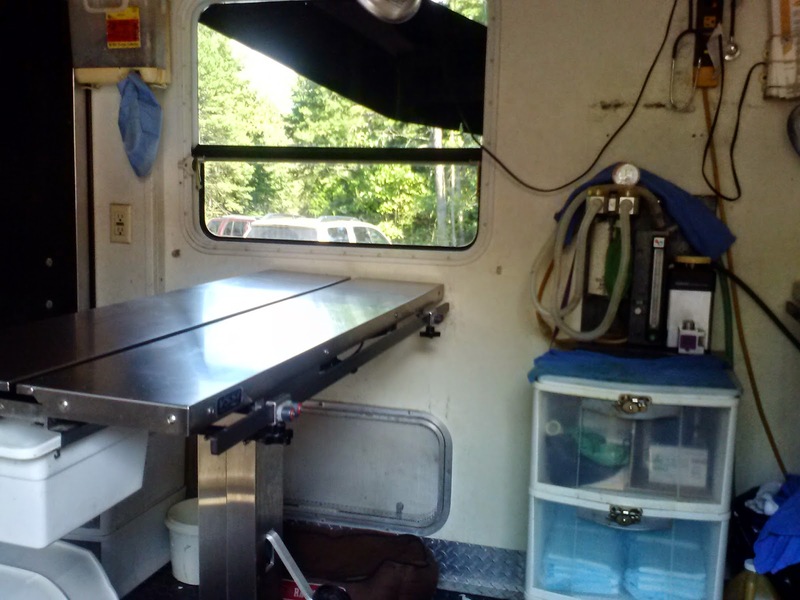 What makes The League unique is that they focus on providing spay and neuter (S/N) mobile clinics for their good but poverty-stricken (approximately $13,000/year) neighbors who live in rural areas surrounding The Village. 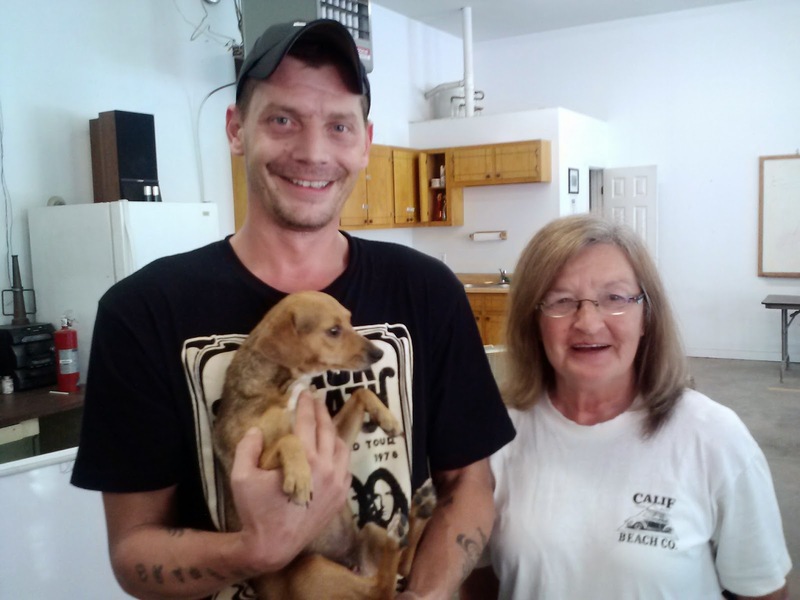 These good people rescue stray and abandoned animals, but they cannot afford to take the animals to veterinarians to have them spayed and neutered. The people pay the clinic what they can afford, but they can’t afford much. Let me say that again: The League does not provide S/N clinics for The Village; they provide desperately-needed services for their non-Village neighbors who cannot afford to spay and neuter their rescued cats and dogs. Yesterday I drove around one of the stunningly-poor unincorporated towns where a two-day clinic would begin today at the fire station. The town isn’t even on the census. The world has forgotten it. 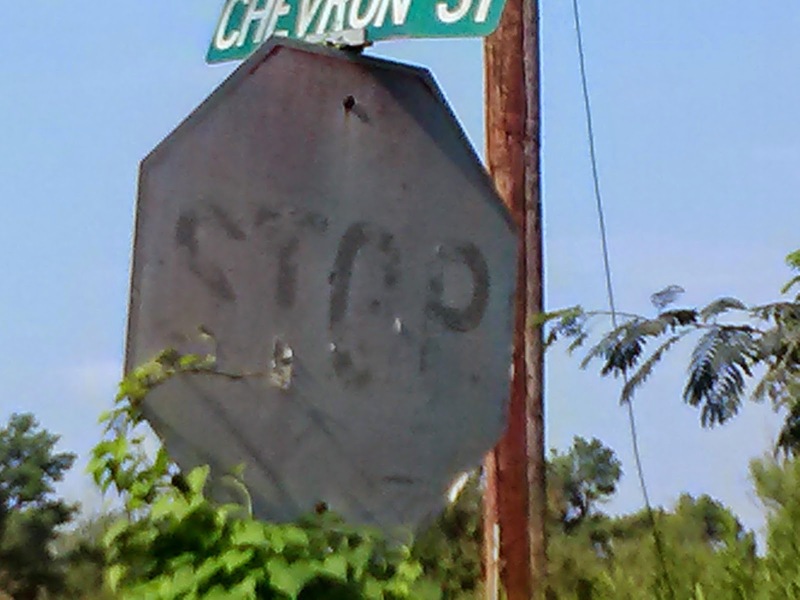 Even the stop signs are faded to white. As I drove through the run-down, unpainted houses and the trailers with tape across the cracked windows, I waved to people sitting on their porches. A lot of people were sitting on their porches because nobody can afford air conditioners. The 90 degree heat outside was cooler than the 110 degree heat inside. But despite the oppressing heat, everyone I waved to waved back. Many of the dogs in this hamlet live in desperate situations. My heart broke when I saw this heavy-coated husky mix chained to a tree with only rocks and dirt for comfort. Panting, he had plastered himself against the side of his owner’s mobile home trying to feel the little coolness that might remain in the corrugated tin. Today the heat will get to 90. He probably won’t die, but he might wish he could. 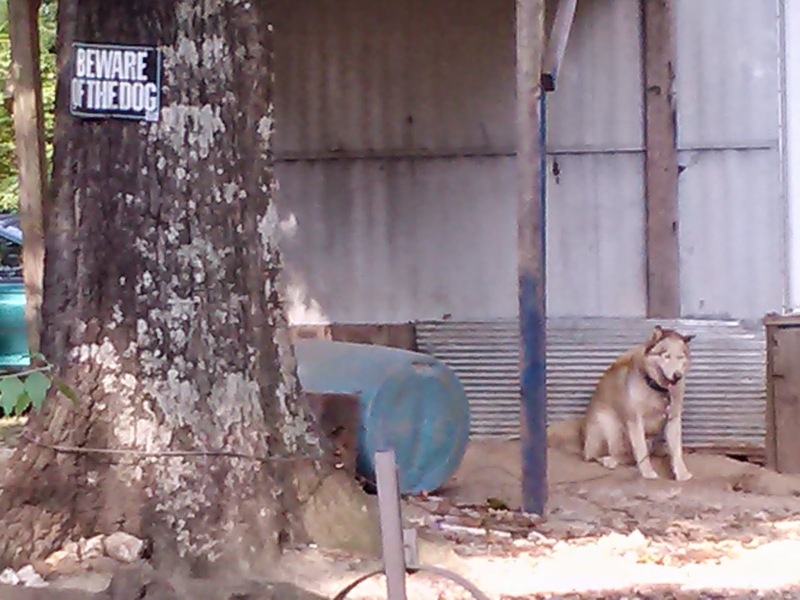 When I saw the BEWARE OF THE DOG sign on the tree to which he was chained, I started to cry. The sign should have said BEWARE OF PEOPLE. But most of these desperately poor people love their dogs and cats and want to take good care of them. 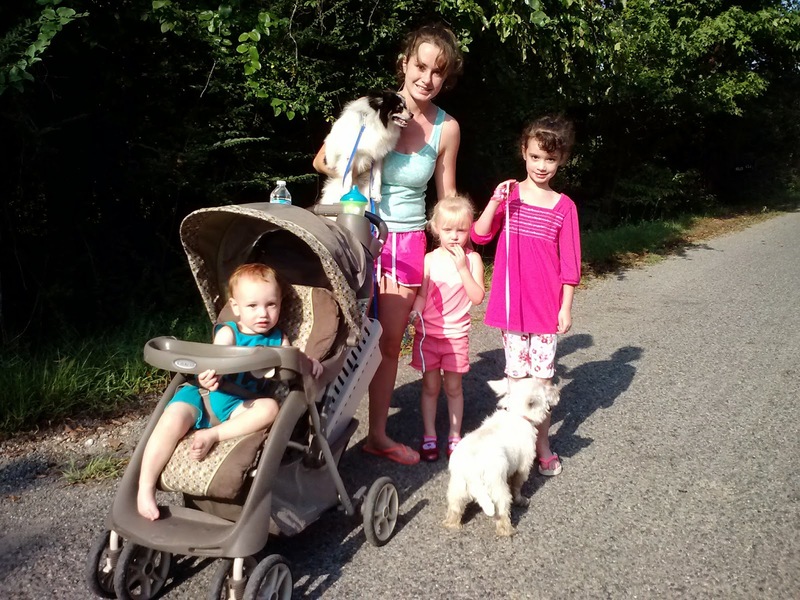 I passed a young woman who was carrying a small Sheltie, pushing her baby in a carriage, leading a Westie, and ushering along her other two little girls. I stopped and asked whether she was headed to the clinic. She said she was. I asked whether I could take her picture. She said I could. I explained that since Bob Barker died and the board closed his foundation, we had lost a significant part of our S/N funding, and I was trying to write grants to help continue the clinics. She said, “Thank you so much. I can’t afford to take these dogs to the vet. I rescued them this week from a lady who had rescued them from a puppy mill. They stunk and were covered in ticks that took me all evening to pick off after I bathed them. So now I have to get them fixed so they don’t have any more babies. I think this one’s already pregnant,” she said, nodding at the one she was carrying. She’s the kind of good folks that The League is trying to help. But we need money to carry on the work. After I left her walking down the road, I went to the clinic to see what I could see. The dogs were all ages and sizes, from a big, grown blue-eyed husky, to a nervous adult Chihuahua, to a frightened puppy, to a rambunctious bunch of year-old mixes of all colors and coats with one blue and one brown eye. I figured the husky was the source of all those youngsters and countless more. My heart filled with pride as I watched our President Mary, a former nurse, listen to an unconscious kitty’s heartbeat; our Spay and Neuter Coordinator, Angela, comfort a kitty who was trying to awaken from the anesthesia; and a man I never saw before tag a cage for the next patient. These wonderful people (and 96 more) could have been home savoring a second cup of coffee over a good book, playing a round of golf, or sleeping in. Instead, they were helping animals in need. Not their own animals, but the animals of a community who lacked the money- and often education- to take care of the needs of its own dear dogs and cats. But volunteers can’t pick up scalpels and operate on dogs and cats. They can’t perform spay and neuter surgeries. For that we need vets, mobile clinics who will come to these poverty-ridden locations and provide the services that the animals so desperately need. For that, The League needs money: $5000 for each two-day spay and neuter clinic so young ladies who try to rescue neglected dogs can walk down the road to get help for them. So big blue-eyed huskies can stop multiplying endlessly. So maybe, just maybe, dogs chained to trees in the searing heat under signs that scream BEWARE OF THE DOG will become only a distant memory. I thought Maggie was Tom’s mother when they came in to the clinic together. Tom’s two dogs were out of surgery and in recovery, so I asked Maggie if I could talk to her while Tom completed the release forms. “You’re his mom?” I asked, certain that she was. Thanks, Maggie. You’ve already helped than you’ll ever know. Al and his wife have a two-year-old son. His wife is pregnant, and they found out yesterday that the baby girl may have spina bifida. If she does, she will be paralyzed below the cleft in her spine. I didn’t tell Al that. I don’t think Al can read, and I think he has problems processing verbal information, too. He loves his dog, Jack, but although we told him not to feed Jack breakfast before his neutering surgery, he did. We had to reschedule Jack for the last slot of the day. When Al arrived to pick Jack up and we told him that Jack was in surgery because he’d been fed breakfast, Al stood quietly in a corner and waited patiently until he could join his dog in the recovery area. I explained to him how a dog -or a person- could die from stomach food coming up and getting into the lungs during surgery. He hadn’t known that. “Oh, sure,” Al said, relieved. Then he joined little Jack in the recovery area and whispered sweet nothings in his ear until he could take the little guy home. The elements of good woodwind sound are stability, clarity, focus, color, and depth. Today we will think about clarity. I had cataracts. Little-by-little my world became fuzzy. I didn’t notice at first. Because my vision deteriorated at a snail’s pace, I thought I saw fine: my world was a lovely, soft blur of yellowish tones. When I finally realized that I couldn’t read street signs well enough to be safe driving in unfamiliar territory, I had my eyes checked. Out came the cataracts. Letters on signs stood out in crisp relief to the blank space around them. They startled me. The silver keys of my clarinet startled me as they contrasted with the shiny black of the granadilla. Nothing was fuzzy. I liked what I saw. Crispness. Definition. In addition, colors were no longer muted. My cataracts were brown, so everything appeared yellowish-golden. I told my hair stylist that my hair was turning yellow. She said it was not. I argued because I could SEE that it was turning yellow. She shook her head. I went to the dentist and complained that my teeth were turning yellow. He said they were not. I argued because I could SEE that they were turning yellow. He shook his head. When the cataracts came out. I was startled to look in the mirror and see my white hair and teeth. “Oh,” I said to myself. My world went from a fuzzy, muzzy, muffled, muted blur to a crisp world of objects that nearly sparkled in sharp relief to the space around them. With clarity, each note of the clarinet or other woodwind stands in sharp relief to the nanoseconds of silence that surround it. The sound is tight and contained, the edges defined with laser-finesse. The sound sparkles, whether the timbre is light and bright or dark and mellow. Sound with poor clarity- fuzzy, muzzy, muffled, and muted- blends into the silence. The nanosecond where sound begins and silence ends lacks definition. Think about the trumpet player who sits behind you. The one to whom you occasionally say, “Can’t you point that thing in some other direction?” He probably has a clear sound. Brass players have different clarity problems than woodwinds do. Now think of his sound when he stuffs the mute in his horn. (Which we wish he would do more often.) Now you can’t easily tell where the sound begins and the silence ends. They lack definition. I asked my band-director-dad, Phillip Wilson, what was technically happening when sound lacked clarity: was fuzzy, muzzy, muffled, and muted. He said that the harmonics were out of proper proportion, that clarity of sound was proportionately proper harmonics. Every sound has a fundamental frequency, and then the harmonics, which are multiples of that frequency: the frequency doubled, trebled, quadrupled, quintupled, sextupled, sextupled, etc. When the frequencies are not in proper proportion, we get FM3 (fuzzy, muzzy, muffled, and muted) sound. Dr. David Griesinger (www.davidgriesinger.com, noted Harvard-trained physicist/acousticist/concert-hall-designer, said that clarity is the quality that allows us to perceive distance, timbre, and location of a sound. I put these four ideas together to come up with the following working definition: Woodwind Clarity, the opposite of a fuzzy, muzzy, muddled, muted tone, is the quality that allows us 1) to demarcate the edges of the tone from its surrounding silence and 2) identify the distance, timbre, and location of the tone. Clarity is the result of proper harmonic proportion. I am proud of my definition. Use it at will. Just be sure that your woodwind sound is clear, however you define it.